Sweet corn season’s come and gone. 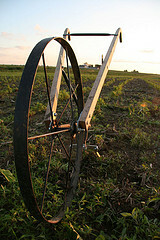 Our acre of sweet corn was the first thing we planted to test out our new row crop planter this spring. Sweet corn is always a short crop compared to field corn and other crops, but this season seems to have gone by even faster than usual! This year, we chose a 75-day variety called “Luscious.” Yum. 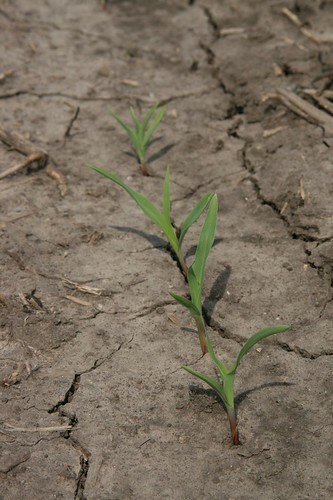 Planted on May 24, this photo of the new corn sprouts was taken on June 6. One month later, July 6, the dew-laden plants looked beautiful in the early morning light. By July 19, the silks (above) and tassles (below) were out. 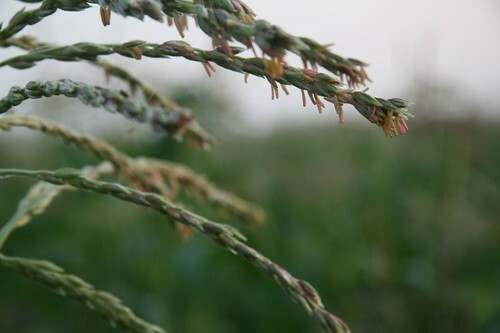 Silks are the pollen receptors: each strand, if it’s pollinated, will become one kernel. 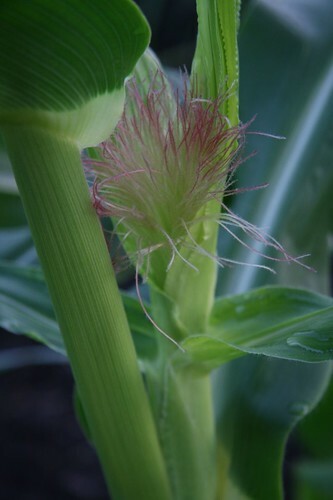 As you can see in this photo, tassles are the framework for the tiny flowers whose pollen will rain down on the silks. Then all of a sudden, the corn was head high and we were picking 80 to 100 dozen ears a day! 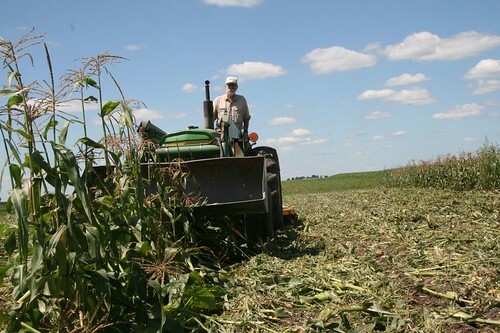 Pictured below are some of our sweet corn picking crew who live on the farms surrounding ours. Sweet corn picking starts at 6am and usually ends by 9 or 10. This was nearing the end of our picking season, August 6. Our corn (and wheat berries!) 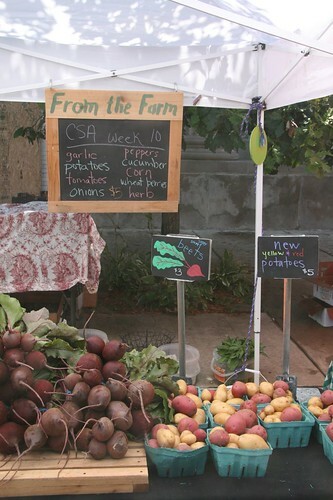 were advertised as part of the Montalbano Farms CSA share at the Logan Square Farmers Market on August 7. One day turn-around, from field to customer! 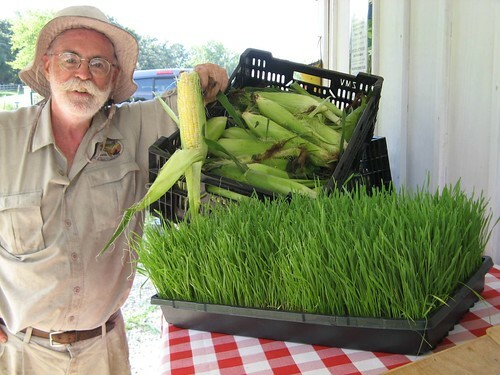 Many ears were also sold by our friends at Sweet Home Organics in St. Charles – along with wheat grass that our friend Lia grew from our wheat berries. We finally mowed down the remaining stalks on August 11. Next year, we hope to be able to plant a few smaller batches, spacing them a week or two apart. We want to eat sweet corn for a whole month! Added bonuses will be a reduction in the risk of losing the whole crop due to weather or pest pressure, and elimination of the stress of picking a whole acre at a time. We’re learning something new every day. 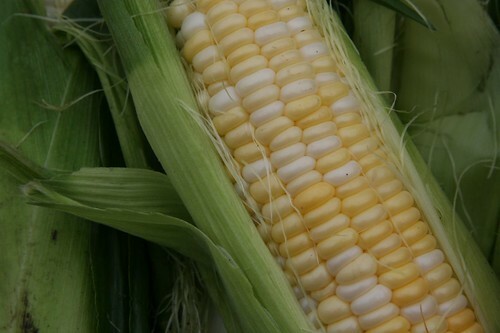 Luscious sweet corn ears are a beautiful bicolor, the plump kernels a mix of white and yellow. When the colors are subdued early on in the season, this coloration is sometimes called “peaches and cream.” They taste delicious – buttery and sweet, even raw. 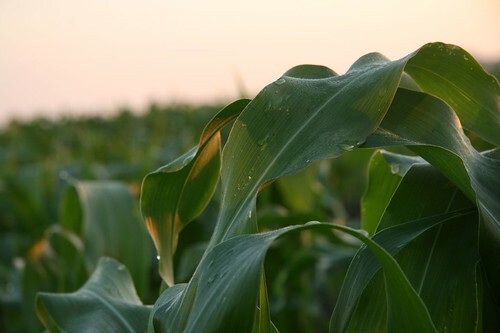 Our favorite way to eat sweet corn is to boil whole ears for 3 minutes and then roll them in butter, salt, and pepper. That’s luscious, all right.